clock frequency can't go below this value. Clock frequency becomes low memory time period of clock becomes high. When this time period increases beyond the time period in which the non-volatile memory contents must be refreshed, we loose those contents. So clock frequency can't go below this value. prefetching the instructions to be executed can save considerable amount of waiting time. Because CPU is faster than memory. Fetching the instructions from memory would require considerable amount of time while CPU is much faster. So, prefetching the instructions to be executed can save considerable amount of waiting time. A simple and reliable data transfer can be accomplished by using the ‘handshake protocol’. It accomplishes reliable data transfer because for every data item sent by the transmitter __________. in this case receiver has to respond that receiver can be able to receive the data item. all macro definitions are processed during the first pass only due to all macro expansions done during pass 1 only not in pass 2.
used to assign storage address to the program's statements. is used to assign storage address to the program's statements. As the instruction of a source module are being assembled, the location counter keeps track of current location in storage. Though the edges are to be sorted still due to union find operation complexity is O(m log n). The maximum is 3(n - 8) for every n>2. NAND and NOR operation follow commutativity but do not follow associativity. NOR gate, NAND gate, Multiplexers and Half adders can also be used to realize all digital circuits. Bit string is a technique for constructing a processor from modules of processors of smaller bit width, for the purpose of increasing word length. PCHL is an instruction in 8085 which transfers the contents of the register pair HL to PC. This is not a very commonly used instruction as it changes the flow of control in rather ‘unstructured’ fashion. This instruction can be useful in implementing. The start and stop bits are used to synchronize the serial receivers. Which of the following problems is not NP-hard? Where L is leaf node. So, no. of internal node is 4. So, no. of internal node is 7. The above graph with 5 vertices and 10 edges is non-planar. As no comparison based sort can ever do any better than nlogn. So option (A), (B), (C) are eliminated. O(nlogn) is lower bound for comparison based sorting. As Radix sort is not comparison based sort (it is counting sort), so can be done in linear time. Let the semaphore be S.
Initial value of S is 7. Lets give 2 tape driver to each process, so that there will be deadlock. So 3 processes will be given two drives each so that there will be deadlock. So to avoid deadlock maximum no. of process should be 1 less than the minimum no. of process that will cause deadlock. So for n=2, the system is guaranteed to be deadlock free. Which of the following is an example of a spooled device? The terminal used to the input data for a program being executed. A line printer used to print the output of a number of jobs. Spool stands for simultaneous peripheral operations online. FOLLOW(A) and FOLLOW (A) may be different. FOLLOW(A) and FOLLOW (A) are always the same. All the three sets are identical. All the three sets are different. LFOLLOW may be different but RFOLLOW and FOLLOW will be same. Consider the SLR(1) and LALR (1) parsing tables for a context free grammar. Which of the following statements is/are true? The go to part of both tables may be different. The shift entries are identical in both the tables. The reduce entries in the tables may be different. The error entries in the tables may be different. Goto parts and shift entry must be same. Reduce entry and error entry may be different due to conflicts. Which of the following regular expression identifies are true? (B) RHS generates Σ* while LHS can't generate strings where r comes after s like sr, srr, etc. (C) LHS generates Σ* while RHS can't generate strings where r comes after an s.
(D) LHS contains all strings where after an s, no r comes. RHS contains all strings of either r or s but no combination of them. If G is a context-free grammar and w is a string of length l in L(G), how long is a derivation of w in G, if G is Chomsky normal form? CFL's are not closed under intersection and complementation. For every NFA there exists a DFA. For every NPDA there does not exist a deterministic PDA. Every non-deterministic TM has an equivalent deterministic TM. → Assign addresses to all statements. → Save the values assigned to all labels for use in pass 2. → Perform some processing of assembler directives. → Assembler instructions by translating opcode and symbolic operands. → Generate data values defined by BYTE, WORD. → Perform processing of assembler directives not done in pass 1. → Write the object program and the assembly listing. How many edges are there in a forest with p components having n vertices in all? 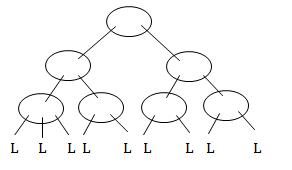 Forest is a graph with no cycle. Now, '0' edges for p-1 vertices (p-1 components) and n-p edges for n-p+1 vertices (1 component). So, total of n-p edges for p components. Assume that the last element of the set is used as partition element in Quicksort. If n distinct elements from the set [1…..n] are to be sorted, give an input for which Quicksort takes maximum time. → The array is already sorted in ascending order. → The array is already sorted in descending order. Which page replacement policy sometimes leads to more page faults when size of memory is increased? FIFO, because it sometimes leads to more page faults when size of memory is increased.